When I was a kid, in the “olden days”, I knew of no-one who had a home ice cream maker. Perhaps, growing up in Canada, it seemed ridiculous to actually own a machine to churn ice, when there was so much of it lying around on the ground! So, for many of us, myself included, “going out for ice cream” was a big treat, reminiscent of hot summer family drives, in very large cars. I have fond memories of Saturdays when my Dad was “Parent on Duty” while Mum was at work. The “messages” (the Scottish term for running errands) we would run involved going to the Scottish bakery (for Black and White crust bread) and butcher shop (for flat, square sausages) in the morning, then on to the New Westminster Public Library, where we kids would be escorted as far as the Children’s Section. Dad would then drift off to the mysterious and hushed Reference Section. I remember it was always a little nervous making to go into the big Adult section to try to find him. The books smelled different in that room. More serious, perhaps. Anyway, by the time we all had a large stack of reading material for the week (I have always loved the smell of books – the glue, the pages, the crinkly plastic of the dust jackets), and could winkle Dad out of the Record Section and back to the car, its interior smelled richly of Black and White crust bread, and we were all ravenous. So we dumped the library materials in the car, and went around the corner to the Dairy Queen. I know. I know. After all that, you were expecting something like a wonderful little hole-in-the-wall ice cream shoppe, where a smiling wrinkled old woman, scooped out marvellous creamy secret recipe concoctions, like Apple Pandowdy. Nope. This was the early 70s, and there was nothing like a DQ soft serve, especially if Dad could be convinced to let us get chocolate dipped cones. Anyway, that drippy oh-so-white mixture in a Styrofoam cone, with the magical crackly coating, made for a pretty much perfect Saturday. But now, my tastes have changed. What is the best place in my home town (and its environs) to experience really good ice cream or gelato – especially the CHOCOLATE ones? 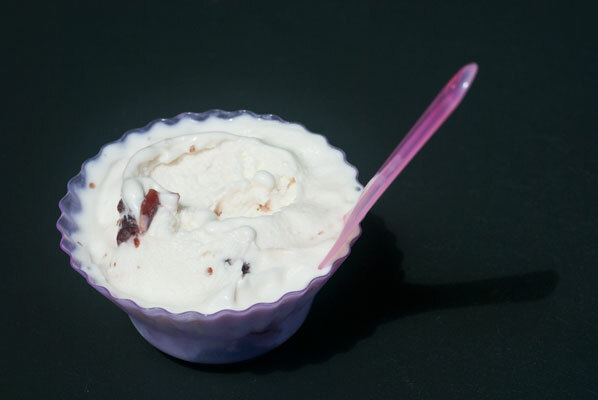 Ice cream and gelato are very personal tastes. I know I am throwing open a subject where passions and loyalties are divided and strong – sometimes within families. And the experience of “going out” for ice cream or gelato is much different than making it at home, a very different event. The choice alone, can be staggering. Or sometimes, a place can boast just a few, perfect flavours. I have asked several of my esteemed friends and family to give me their favourite sort of local, independent ice cream/gelati places. Here follows their highly subjective, but passionately defended choices, in the order I received the recommendations. 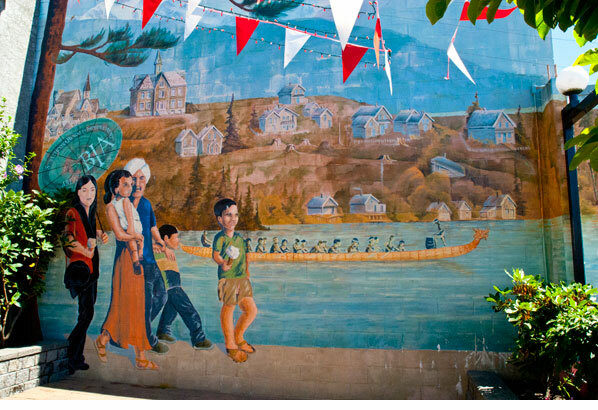 Our “local”, here in North Vancouver, Brazza is the favourite of many of my pals. It has become a busy, but very friendly hang-out for everyone from serious-looking folk discussing literature and world news, to moms with wee ones toddling about, to hordes of sweaty teenagers just finished a game, to soccer obsessed fans watching on the TV screens, and the friendly staff behind the counter are ever-helpful, offering as many tastes as desired. from the University of Texas, and is a former employee of Enron – that’s correct, Enron. To read that story, please visit their website. Suffice to say, Lino turned that bitter-ending chapter of his life into a wonderful gelato flavour: “Enron Overload”, which has ginseng, guarana and is green to reflect the greed that led to the company’s undoing. 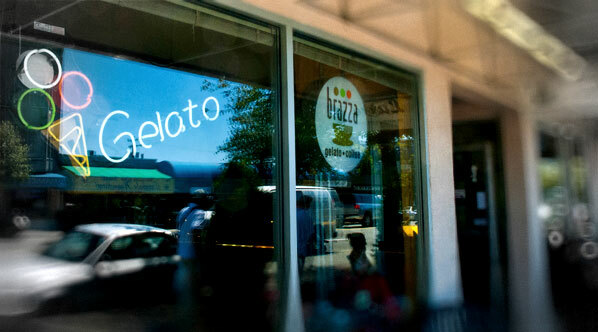 Brazza also serves wonderful coffee, so even if your party is not in the mood for a scoop, they can have their espresso Una tazza fresca, meaning a “cool cup”, which consists of gelato and espresso. The gelato has a little steamed milk poured in it, then stirred until smooth, then espresso is poured over top. 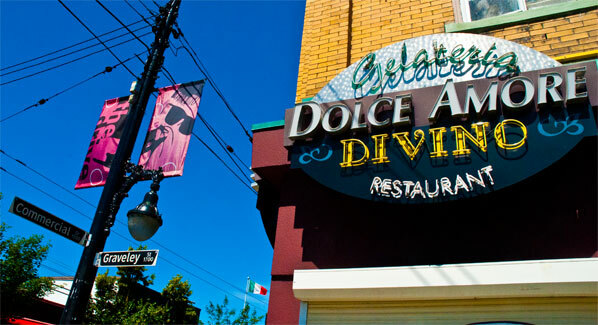 An East Vancouver institution since 1982 (in their present location since 1994), La Casa Gelato has the distinction of having 218 flavours in store, at any given time (although they make 518 flavours, and the number is always rising). Housed in a building known as “the pink palace”, Vince Misceo has become famous for making gelato in some very different flavours including durian (the smelly fruit, likened by some to rotting flesh, adored by others), corn, blue cheese, curry … as well as the more familiar fruit and chocolate flavours. People do have a great loyalty to this place, but I must say, the last time my family visited, I was struck by the incredibly loud music, which seemed to indicate we should make our selections and leave as quickly as possible. It can be overwhelming to try to find just the flavour you want, but there are unlimited tastes, after you pre-buy a token. 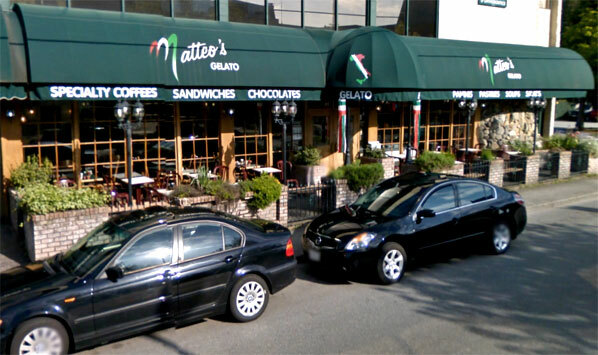 I have never been to Matteo’s, but these recommendations may find me making my way out to visit my friends in Port Coquitlam! I have a friend who, when her partner brought home a tub of this ice cream, took one look at the name, and the bright yellow package featuring happy cows, and thought “stupid name – even stupider packaging”. I confess to quite liking both of these things, but my mother always told me I shared many of my tastes with pre-schoolers! She does however, love the product. 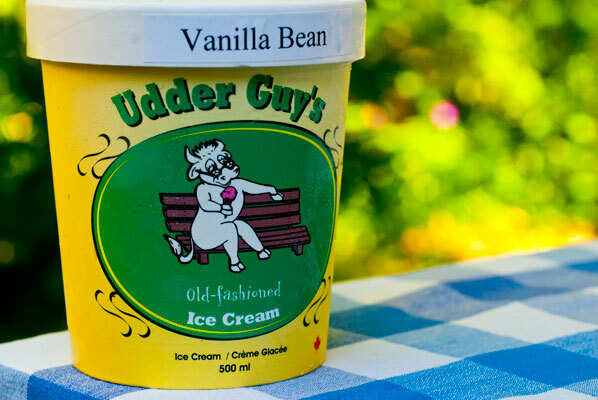 I would love to go and visit them at Cowichan Bay (near Duncan) on Vancouver Island, where their home parlour is located (I have just put it on “the summer to-do list”), but am delighted to see that, in the mean time, their product can be purchased as a few establishments on “the mainland”. As for their Choco-Chip Cookie flavour: They make their own chocolate chip cookies and fold them into the milk chocolate ice cream. Like dipping chocolate chip cookies into chocolate milk. Mmmm. I love the whole idea of this company, and my Saltspring Island friends agree. 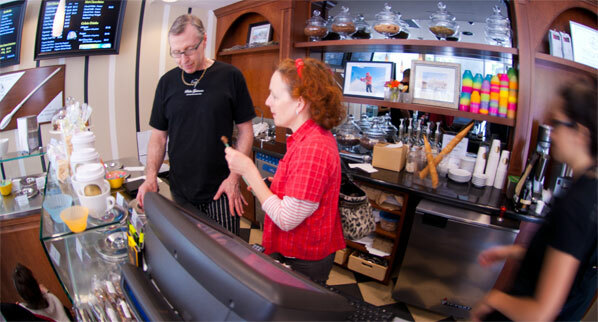 I first had the pleasure of tasting their product while working for a theatre company on Saltspring Island, and walking into town every day past horses and flower fields and ending up in town next to this place – yes it is as romantic as it sounds. 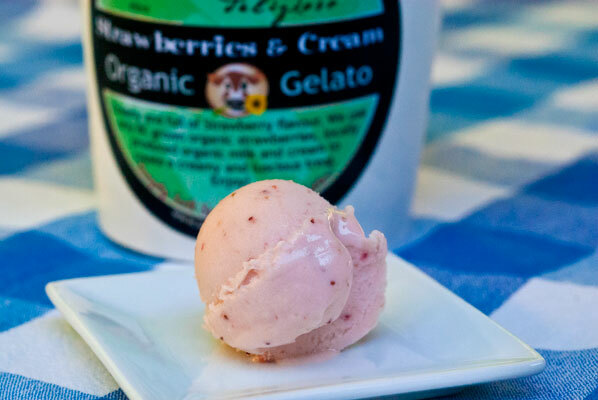 Not only is the gelato really tasty, for the most part the flavours are based around seasonal fruits and sourcing as much from local providers as possible. 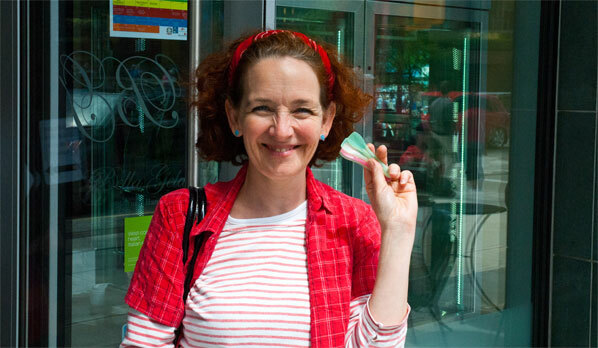 They also are the first carbon neutral ice cream or gelato company in Canada. The Mount Maxwell Mint – hand made dark chocolate and natural mint is particularly yummy. My recommendation. I first heard about this place from the same wise colleague who introduced me to Mink Chocolate. 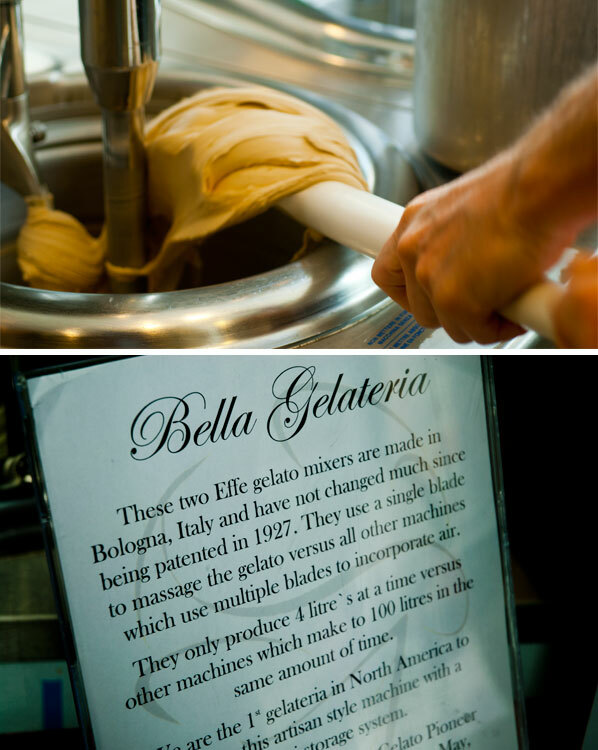 I am forever in her debt, because Bella Gelateria is absolutely divine. I love anyone who is passionate about what they do, and James Coleridge, owner and master of gelati who, among his other distinctions has been accepted as the Gelato Capitan, representing Team Canada at the World Cup of Gelato competition in Rimini, Italy in January, 2012, is so passionate about his gelati he regularly invites people (myself and my lucky partner included) behind the counter to sample whatever flavour is coming directly out of the machine, and whichever other flavours he really thinks you need to try that day. You can stand, hypnotized as the mixers and a delicate spatula, churn the gelato, until the moment James deems it to be ready, whereupon it is scooped, with a large paddle into stainless steel pozetti, with lids, to preserve consistency, temperature and flavour. Oh, the flavour. I was able to sample most of the chocolate flavours on hand that day (the array of flavours changes with the season) and felt my knees buckle, upon tasting the Michel Cluizel chocolate and Maldon sea salt, followed by a plate cleanser of limonetto, to enable me to fully enjoy the heavenly Chocolate Noir. James is not particularly interested in volume sales, stating, “It’s not about selling a product, it’s about sharing an experience”. And that is an experience worth sharing. And so, amici miei, I leave the last word to you. 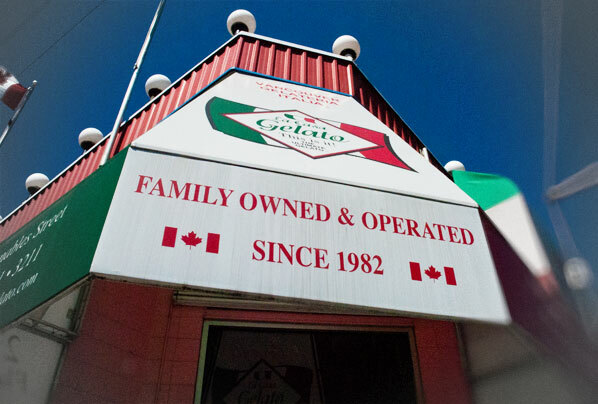 What is your favourite local ice cream emporium/gelateria ? You can add your comments below or email me to share your local treasures. Grazie mille!